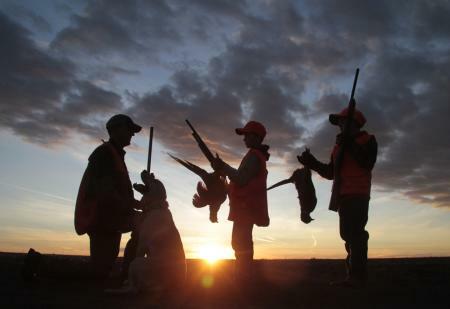 Kansas pheasant and quail hunters have another fun year coming in the seasons that run Nov. 10-Jan.31. Last year, Kansas’ quail harvest was tops in the nation and second only to South Dakota for pheasants. The official fall forecast comes from thousands of miles driven, as biologists and others check for winter survival and finally broods along established routes. As in years past Kansas will offer hunters over 1.5 million acres of public hunting! More than 1 million of that is within the state’s legendary Walk In Hunting Area program, which leases land from private owners and opens it to public hunting. Cover conditions are good to great over much of Kansas, which bodes well for bird survival and plenty of places for hunters to look. Last season’s pheasant numbers ranged from fair to very good across central and western Kansas. In many areas hunters and landowners hoped good nesting this spring could push populations back to where they were before the drought years four to six years ago. That happened in some places, but certainly not all as winter drought, then early summer storms, complicated nesting conditions. But bird numbers are far better than, say, five years ago. North-central and Northwest Kansas had the best nesting and brood-rearing conditions and should have good hunting, as should parts of southwest Kansas. Other parts of south-central and western Kansas are projected to have “fair” pheasant numbers, with some localized good areas. Because of the amount of heavy cover, and inconsistent populations in some areas, this could be great year to try some late season pheasant hunting in Kansas. The first snows and cold will force birds from marginal habitat, and into thicker cover near food sources. Ideal places may have three to four times more pheasants later in the season than opening weekend. Public land hunters may want to spend some time looking at satellite images, locating walk-in areas near good food sources, like un-turned corn or milo fields. Yep, what you read up above was true. Kansas lead the nation last year for bobwhite quail harvest. It’s usually in the top three, at least. That’s because good nesting conditions coming off the drought four or five years ago brought quail numbers back to the best some avid hunters had seen in 30 years. Some senior hunters in northwest Kansas said they’d never had it as good as the 2018 season! This year’s hatch isn’t quite as good, but most hunters won’t be able to notice the difference. All areas of Kansas remain well above their long-term average for quail numbers. Central Kansas probably has the best potential and the northern Flint Hills could be good. Don’t rule out parts of northwest Kansas where the habitat is right. In a nutshell, as recently as 10 years ago few quail hunters in America ever thought they’d again see bobwhite quail hunting as good as what it should be in Kansas this year! For more information on all things about bird hunting in Kansas, go to https://www.ksoutdoors.com/Hunting.